Unlike my previous journeys which are scheduled at the last moment, my trip to Hyderabad was planned almost a month ago. Initially I was supposed to travel to Hyderabad on 1/12/2012 however due to some changes in plan, the trip was postponed to 8/12/2012. As I work late into the night, I had made elaborate plans to take the first KSRTC bus departing to Hyderabad from Bangalore at 6:30am. Going by the plan, at around 7pm the previous day I decided to book my tickets on the 6:30am Airavat service and hence logged onto the KSRTC website. However little did I know, my plans was about to take a beating. The 6:30am service was "Full"
Reached Shantinagar Bus Stand at 8:30am and saw the Blue color Rajahamsa A/C bus boarding passengers. Walked up to the bus and saw the crew helping out a senior citizen load the luggage in the luggage bay. Asked the conductor about the seats and he said to take any seats after seat number 25. Boarded the bus and took a window seat (seat no 31). 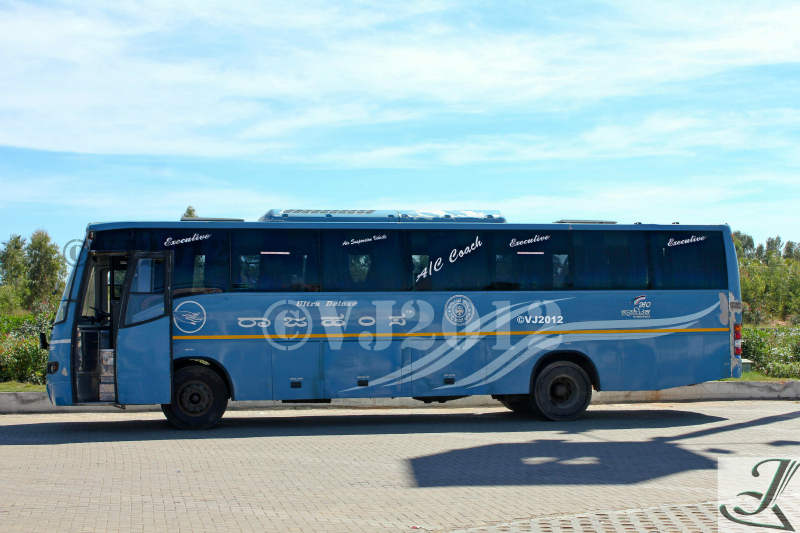 The bus was an Ashley (Ashok Leyland) which had 44 seats with 2X2 configuration. The interiors were refurbished and the Harita seats looked brand new, not sure if the seats were replaced. we were still waiting for couple of passengers who had reserved their seats but not showed up yet. Finally they came in and the bus departed at 9:05am. The bus was almost full with couple of seats at the last row being empty. The Saturday morning traffic was showing no respite as our bus slowly crawled its way towards KBS. Here the last row seats were taken and the bus moved on. Needless to say that the bus was powerless when compared with the lights of Volvo and Mercedes however the suspension was top notch. The bus clearly lacked the power however the suspension was doing its job ensuring to provide enough comfort for the passengers sitting inside the bus. The A/C was also set at a proper temperature. At this point of time I decided to take some shut eyes and slipped into a quick nap. I was awakened by the conductor who was shouting out at passengers to have their ‘Breakfast’ here as the bus wont to stopping for another break till 3pm. The bus pulled into the Kamat restaurant at Chikkaballapur. The conductor was urging the passengers to hurry up as the bus was already late. I got down and went about taking few pictures of the bus and as always got few weird looks from the people around. The passengers hurried up and came back having their brunch and bio break, however the crew was nowhere in sight. Since the engine was switched off, it was hot as oven inside the bus and as it was a sunny day, it was equally hot outside the bus. Finally the crew showed up and we departed at 12pm. We resumed our journey and the lack of power was clearly illustrated on the highway, the bus was being overtaken by cars and other vehicles however our driver ensured not to block the vehicles which were overtaking us. I switched on the GPS on my cellphone and it recorded the max speed of the bus to be around 75kmph, not bad for an AL engine powering both the bus and the A/C. We reached Anantapur by around 2pm. We pulled into the bus stand with great difficulty as the roads leading to the bus stand is dug up and there was no one to manage traffic. 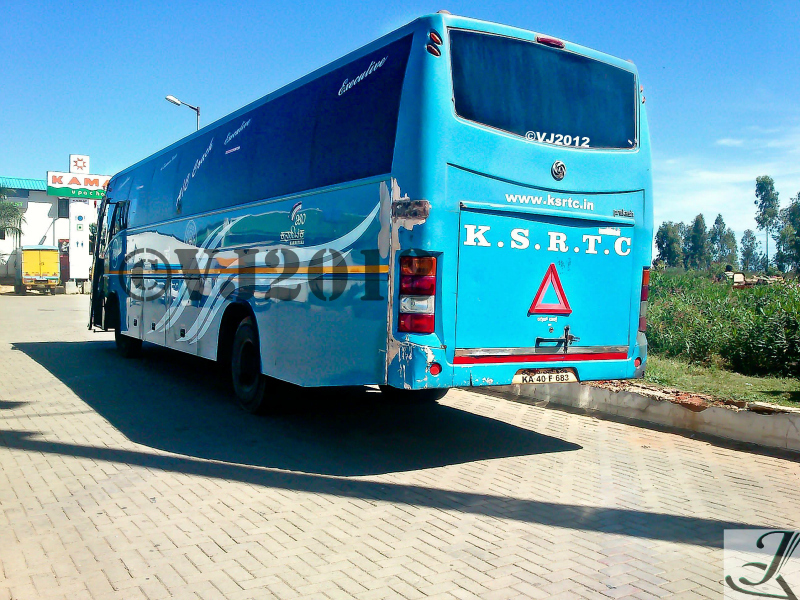 Here, few passengers got down and around equal number of passengers boarded the bus. We resumed our journey again and at around 3:30pm the bus pulled into a road side ‘restorent’. The road side eatery was in a terrible condition and the ‘Tai-let’ was horrible. At this point I spotted a VRL B9R heading towards Bangalore doing great speeds. That’s when I realized about the VRL’s morning service to Hyderabad and the fact that I overlooked it. However my journey so far was good expect for the time which was being eaten away. We resumed our journey again and this time I decided to spend some quality time in the driver’s cabin. Started a conversation about the bus and its performance and he said that this particular bus is slow when compared with its counterpart. He even mentioned that this bus had more breakdowns and many a time KSRTC has replaced this service with a Corona. However, he was quick to mention the fact that this was an Ashley and not TATA and he is happy to drive this bus. When asked why this bus doesn’t have a TV inside the bus, he smiled back at me and said he is happy not to have one. Initially this bus had a TV set however passengers demanded to play Telegu movies while playing a Kannada movie or vice versa. The issue became so serious that it reached the depot manager’s office and the TV set was removed from the bus. We chit chatted through our way and we reached Kurnool at around 5:30pm. At Kurnool the bus got full and we departed. Again the bus was driven at the same pace, and somewhere near Mahbubnagar and Jadcherla, I spotted a Kallada B9R speeding on the opposite lane and right behind it was a speeding KPN B9R and an Airavat Club Class. We crossed Shamshabad and entered the city limits. My friends called me up and asked me to get down at Afzal Gunj. I was dropped off at Afzal Gunj at around 8:25pm. The bus would have reached MGBS by around 8:45pm. Needles to reiterate the fact that the bus was low on power however, the comfort provided was nothing short of a surprise. I feel KSRTC should deploy this bus on shorter routes as travelling on longer routes as this one is a bit stressful. Few pics taken at Kamat restaurant. Hope you had a great travel experience, spending time with driver was interesting to know the bus and TV. That's true in some routes TV wont be available because of these kind of reasons. Nice information given here, thanks to share with us. 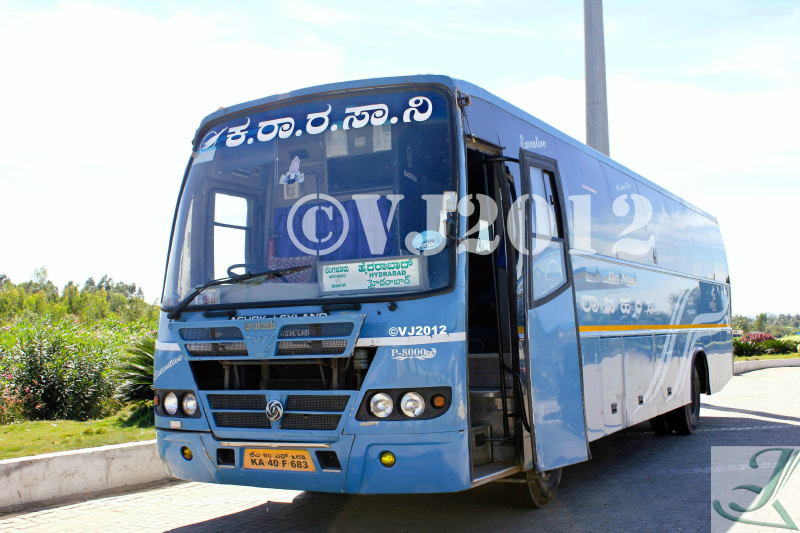 Hyderabad to Bangalore bus is one of the best option to travel with comfortable in low budget.